It’s creamy and briny. I personally prefer Zen because Kusshi has been my favourite. 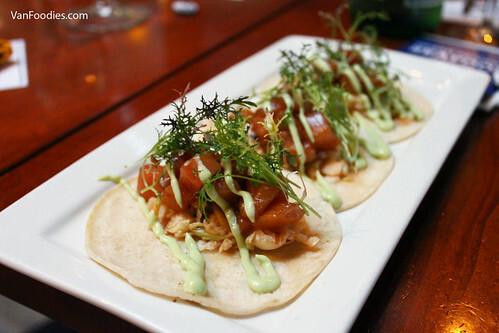 The Haidacore Tuna Tacos use Albacore Tuna from Haida Gwaii, so its supplier Organic Ocean cleverly named it Haidacore Tuna (haha!). The tuna was nicely seasoned, with just the right amount of acidity. There’s subtle heat from the slaw, and creaminess from the avocado crema. I thought the tacos were well balanced, and not overly messy to eat. 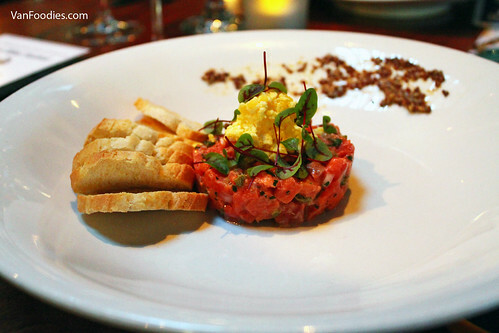 Because it’s sockeye salmon, the Sockeye Salmon Tartare was leaner, more meaty than using, say, pink salmon. It needed extra creaminess, which came from the hard boiled egg. I liked the use of preserved lemon, a good substitute of cornichon; it added acidity, so did the grainy dijon mustard. It’s more of a standard affair, but a well executed dish. 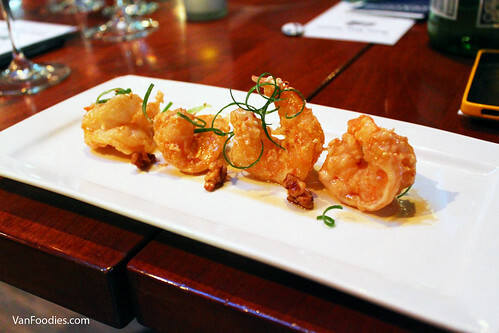 The Maple Walnut Prawns were addicting! It has a close resemblance of the Chinese dish Walnut Honey Prawns 核桃蝦仁. The prawns were just thinly battered, fried to perfect crispness; the flesh still had a good crunch, with a hint of natural sweetness. The maple sauce the prawns were tossed in, combined with the savoury seasoning of the prawns and spiced walnuts just worked beautifully. The menu says that the prawns cost $17.99 and according to the restaurant there are only 4 prawns. I’m sure these are great quality prawns but I found that to be rather pricey, especially I’m used to getting a few more pieces at Chinese restaurants at a similar price point. But these prawns were really good. It was a lot of fun eating the Salish Sea Boil! What you see here should be actual size of the dish. 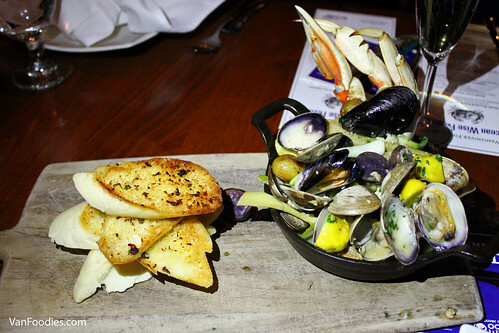 It has a decent serving of clams and mussels, along with half a Dungeness crab. It can be easily shared by two people. The creamy broth tasted garlicky and has taken in the essence from the seafood. The medley of vegetables including artichoke and pattypan squash soaked up all the flavours from the broth. The biggest surprise of this dish? The grilled bread! It was so buttery and after dipping it in the broth, it’s probably one of the best bread I’ve had at a restaurant. The last dish on the menu is the Manila Clam Smoked Sablefish Vongole. 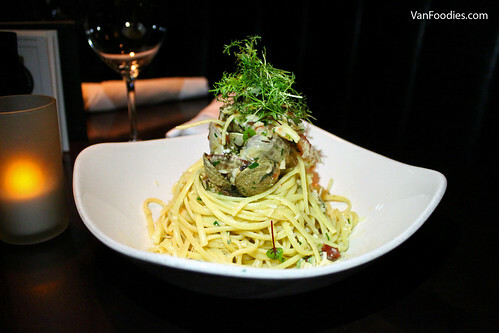 It’s like Linguini Alle Vongole, with a twist that is smoked sablefish. The pasta was cooked to al dente; smoked sablefish and bacon added extra salt and smokey flavour. This was a hearty dish. I was quite full when this was served but I managed to finish my portion anyway. 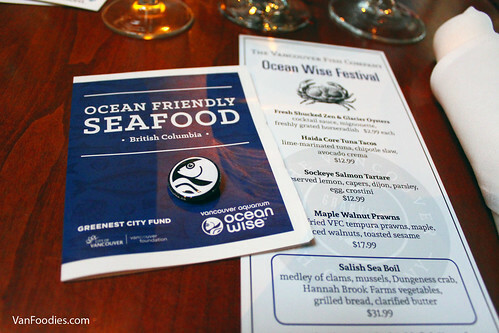 The Ocean Wise Festival runs March 22-April 30. Overall I thought the dishes were well put together and flavours really worked. On top of that, you know the ingredients were sourced in a sustainable way. 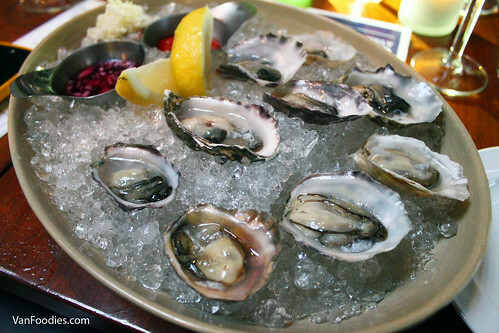 My favourites were Oysters, Haidacore Tuna Tacos and Salish Sea Boil. I’ve never eaten at the Vancouver Fish Company before, but after this menu tasting, I’m intrigued to go back for its regular menu. 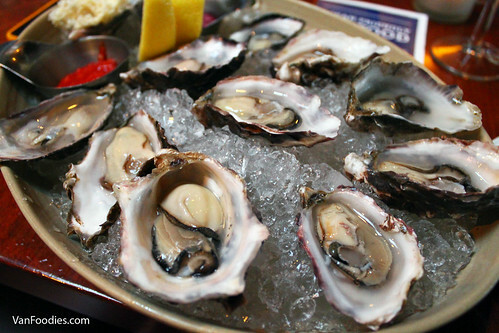 They are located so close to the Fishermen’s Wharf near Granville Island, so it definitely has easy access to fresh and seasonal seafood. Their patio also has a nice view of the water and the dock, so I may just have to return when patio season starts again.